A senior United Nations refugee agency official warned on Wednesday about the “shocking” effects of long-term detention on Australia-bound asylum seekers who are being held on remote Pacific islands. Indrika Ratwatte said the situation in Nauru, as well and Manus Island in Papua New Guinea, was as bad as he had seen in his 25-year career. 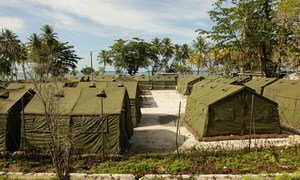 Both locations have been used to house more than 3,000 men, women and children from Afghanistan, Iran, Syria, Sri Lanka and Myanmar, since Australia implemented its offshore processing policy in 2013. Speaking to journalists in Geneva after returning from Nauru last week, Mr. Ratwatte, who heads the Asia and Pacific bureau of the Office of the UN High Commissioner for Refugees (UNHCR), described the “shocking” psychological and the mental toll on refugees and asylum seekers. Despite the clear need to address the problem, the lack of psychiatric help and healthcare “has increased the sense of hopelessness and despair,” Mr. Ratwatte said. He urged Australia to continue to support the authorities on Nauru once it hands over responsibility to the island for medical and psychiatric services. There are currently around 2,000 detainees on the islands. Around 40 children born in Nauru have seen “nothing but detention-like conditions,” Mr. Ratwatte said, and another 50 youngsters have spent more than half their lives there. Under a deal agreed between Australia and the United States, some 1,000 detainees from Nauru will be repatriated to the US Around 180 have already left the island. Welcoming the agreement, the UNHCR official said that this would still leave the same number of people on Nauru, and he urged the Australian Government to consider an offer from New Zealand to rehouse them. “It is a very genuine offer and New Zealand has an excellent programme for refugee settlement,” Mr. Ratwatte said. Stating that the beating of refugees and asylum-seekers at the former regional processing centre on Manus Island by uniformed officers is both “shocking and inexcusable,” the United Nations refugee agency has urged the Australian Government to take immediate action to ensure their safety and protection.